*** This guide applies to ChronoSync v4.6.7 and earlier. From the Connections panel in ChronoSync’s Preferences click on the button. This allows you to add a new connection profile. The button is for editing and the button is for deleting existing profiles. The General panel opens so you can provide the necessary information to connect to ChronoAgent or an InterConneX sharespace. Provide a profile name. The profile name is what will appear in the "Connect to:" popup menu on the Synchronizer document's Setup panel. Thus, it's a good idea to be descriptive with the profile name so that you know which one it is when you have multiple connections listed. In this example "Mac Mini" was used since that was the computer the agent was put on. Choose which agent or sharespace to connect to. Note that only published sharespaces (i.e, those accessible to others) are available to connect to. If an agent is not available, verify that the destination Mac is on the network and ChronoAgent is ON. Instead of selecting an agent in the "Connect to" popup, you can also enter an internet address. In ChronoAgent, on the destination Mac, the internet address can be found under the "Status" panel. You would use an internet address if ChronoAgent is not available on the local network or is on another subnet of a local network. The username and password of the agent or InterConneX sharespace is required here. If these are unknown, ChronoSync will be unable to make that connection. The only exception to this is if the sharespace has required login settings turned OFF. Click on the "Test..." button to test the settings. Once valid, you can move on to the other panels. The "Advanced" panel presents a handful of security and connection options that you may choose. Check out ChronoSync's help for a description of each option. Once you've set the "Advanced" panel up as you desire, move on to the "Mappings" panel. Macintosh users have the ability to control who can access, modify, and see their personal files and folders. Every Mac uses a User/Group model to control file security. Every file is owned by a User and associated with a Group. Groups contain multiple users and are an easy way to grant multiple users access to files which they do not own. This panel allows you to map different users and groups on each machine to each other. The "Mappings" panel has 3 different mapping modes from you to choose from. The are described below. Note that with InterConneX connections, user and group ID mapping is not supported. If None is selected, then the User and Group ID's will not be mapped across different computers and will remain the same. You would do this if you are maintaining a bootable backup over a network or if you do not want anyone else to access the drive on the destination Mac you are connecting to. A connection profile for InterConneX sharespaces will automatically be set to "None." User and group ID mapping is not supported. The Basic mapping mode is rather straightforward. Your local user accounts are listed on the left under "Local User Account." To the right of each account, you'll see a popup menu. These are the user accounts on the remote agent. From the popup, you need to choose the correct user account that maps to your local user account. The Advanced mapping mode should only be mapped by someone who is knowledgeable with Users, Groups, and Permissions. "Local-to-remote mappings" refers to the mapping that is performed when copying a file from the local machine TO the remote machine. "Remote-to-local" is the opposite. In some instances, one side of the user/group mapping may be irrelevant. For example, if you use this connection profile only for left-to-right synchronizations and the right target is your agent, you only need to define local-to-remote mappings since you will never be copying files FROM the remote target back to the local machine. It doesn't hurt to map both sides, though. By default, ChronoSync tries to establish the most meaningful user/group mapping it can. For example, if the user "jdoe" exists on the local machine, it looks for another user named "jdoe" on the remote machine. If it finds it, the mapping will automatically be established. "jdoe" on each machine can be associated to different numeric IDs and ChronoSync will automatically handle the translation. If another user by the same name doesn't exist, ChronoSync then looks for a matching ID. For example, if the local user named "jdoe" has an ID of 503, CS will look for a remote user whose ID is 503. If it finds it, the mapping will be established. If that fails, the user "jdoe" will be "Not Mapped." Entries that are not mapped are displayed in red. A summary is displayed at the bottom of each mapping list to call attention to the fact that one or more entries may not be mapped. 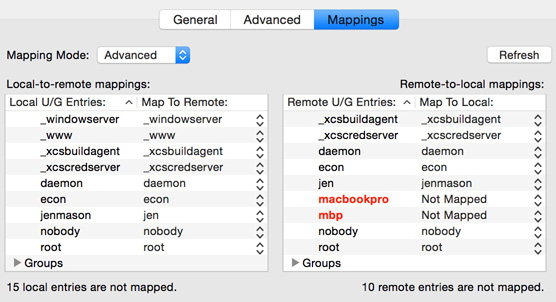 In some cases, it is perfectly acceptable to leave certain users/groups as "Not Mapped." An example would be various "System" user accounts, such as "xgridcontroller", that may exist on one computer but not the other. This mismatch would be irrelevant if all that is being synchronized are user-level files such as those in a user's Home folder. There is value of mapping to the "unknown" user (“_unknown” in Leopard). In macOS, "unknown" is a special user that is accessible to all user accounts. In situations where you want to backup files from one machine to another and you simply want to make those files accessible to all users on the destination machine, just map the relevant users on the source machine to "unknown" on the destination. When you've correctly mapped your user accounts, you can click the "Save" button to save your settings. At this time, your connection setup is complete. You can now use this connection profile to connect to a remote computer or device.